The Bich was launched in 1977 alongside the Seagull and Mockingbird in the BC Rich range of the 1970s. 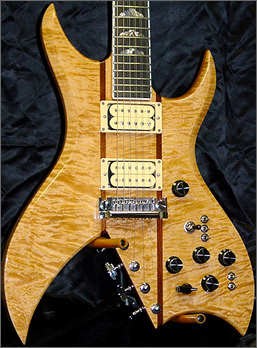 It featured the most daring of BC Richâ€™s â€œvintageâ€ designs, with a body originally penned by renowned luthier Neal Moser. It featured two very unusual cutaways on the bottom of the body, a neck-through design, and originally was only available as a ten-string model (see photo), which had 4 tuning pegs at the bridge end for the 4 extra top strings. However, this limited the appeal of the guitar somewhat, and so a normal six string was launched soon after. It featured all the usual other trimmings on 1970s BC Riches, including elaborate coil-splitting functions and aÂ dizzying array of switches and knobs..
Master Volume, Rhythm Pickup Volume, Pre-amp #1 Volume, Pre-amp #1 On/Off, Pre-amp #2 Volume, Pre-amp #2 On/Off, Phase Switch, Pickup Selector, Six Position Varitone, Dual Sound Rhythm Pickup, Dual Sound Lead Pickup and Master Tone. When all switches are off the guitar is in passive mode. At this time both pickups are controlled by the master volume. Both pick-ups are activated by pick up selector switch. The tonalities of both pickups in passive mode are controlled by the Master Tone. Click on the preamp On/Off switch and get an instant 10 db boost from the gate. At this point the pick-ups are now controlled by the pick-up volume control while the master tone still controls the tonality of both pick-ups. With both pick-ups on, phase switch in the up position will produce an out of phase sound, (a tone resembling a half cocked wah sound). To coil tap the lead pickup flick upward dual sound switch. This converts the pick-up into a single coil sound by separating the pick-up into one coil. Dual sound switch #6 performs the same task for the rhythm pick-up. As you rotate the six-position varitone clockwise, each position produces a distinct sound based on whichever capacitor is in operation. You will also notice a slight decrease in gain but the pre amp volume can compensate the drop and then some. It is only as limited as your imagination. All these switches can be use to your liking & when you find a particular sound you like, make note of the setting for future reference. The B.C. Rich Active Electronics produces a spectrum of 154 distinct sounds. If you really want to get really funky with all switches on as described rotate master tone counter clockwise. If you are a traditional blues player you will find sounds you never knew existed. Note that all pickups function while in passive as well as active mode. The battery can easily be changed by carefully removing the screws for the control cavity plate. The main difference between the active and full active electronics system is that the full electronics system has two independent preamps as well as two volume switches which can work in unison or individually and can naturally distort the volume even at low settings. The B.C. Rich Active and Full Active systems offer more sounds than any other onboard electronics. The Bich is still available and is a very popular model in BC Richâ€™s line. It is available as a ten string, six string, bolt-on and through-neck versions, with prices starting from around Â£250. However, like other older BC Riches, the 1970s versions command upwards of Â£1000 when on sale.